This ruler will help you draw precise, great looking curves between two points. 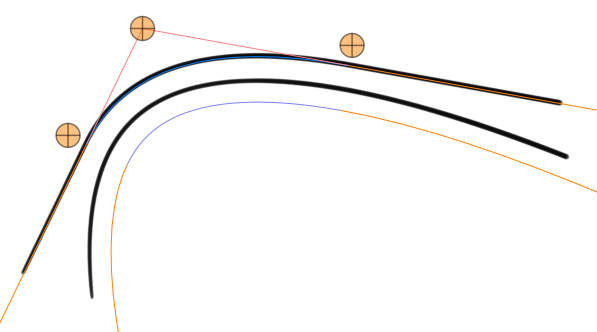 This type of curve is called a Quadratic Bezier curve, and is defined by two outer points connected to one center control point. The two segments form tangents to the curve at the outer points. These tangents are visually extended so that you can align them easily with other lines or curve segments. If you want to draw more complex curves, be sure to check out the Cubic Bezier ruler! Once you've defined a curve by setting the three control points, you can draw along this curve. You can also draw offset curves by starting from any position not on the main control curve. 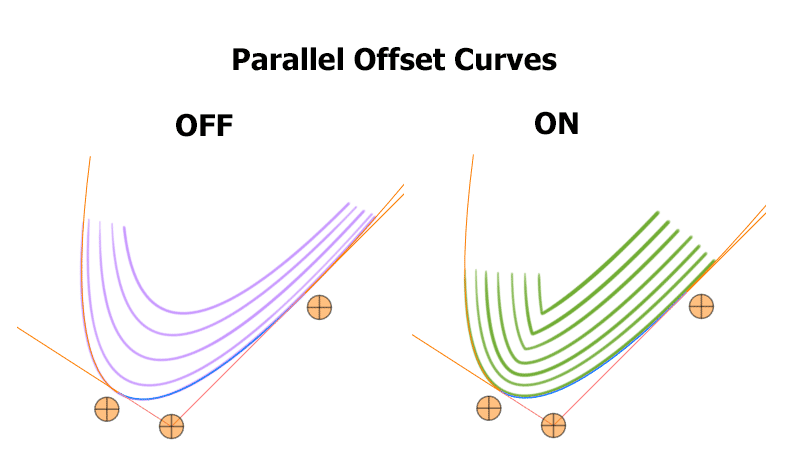 If you enable the Parallel Offset Curves option, you will get offset curves that try to keep the same distance to the control curve. Interestingly, the parallel curve of a quadratic bezier curve is itself not a quadratic bezier, and you will notice that the curve becomes more and more compressed at the bend point if you try to make it tighter. 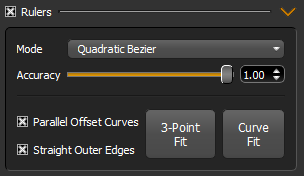 If this option is not enabled, the offset curves will still be bezier curves. If you think of a bezier curve as being a segment of a parabola, these offset curves will lie on identical parabolas that are shifted up or down along their shared axis of symmetry. When you draw past the outer control points, by default the line will continue on the parabola on which your bezier curve segment is defined. 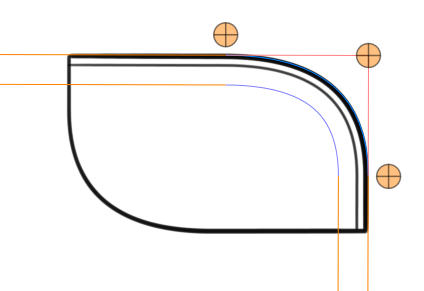 If you enable the Straight Outer Edges option, you will instead draw along the straight edged tangents. This can be useful for drawing rounded corners to non curved objects. Click the Auto Fit button (or use the keyboard shortcut), draw a curve, and the control points will be automatically set so that the curve matches your drawing as close as possible. This is a great way to save time, as it allows you to quickly get a good approximation, and then fine tune it before drawing the final perfect curve. The 3-Point Fit feature will help you setup your curve by clicking on where you want the start, middle (t=0.5), and end points to be. No Key Move the control point. Shift Slide the control point along tangent. Control Move the entire curve. Alt Rotate the curve around the opposite control point. Pressing Alt will also flip the control points around the tangents so that they don't get in the way if you want to draw on that side. When this ruler is active, the "dn" scripting input variable is connected to the current normalized position on the bezier curve. One great way to use this is to connect it to the output pressure to get perfect pressure gradients. The "bezier auto pressure" script mode (in the pressure section) does exactly this. Lazy Nezumi is a trademark of Guillaume Stordeur. Adobe, Photoshop and Flash are trademarks of Adobe Systems Inc. ZBrush is a trademark of Pixologic Inc. Windows is a trademark of Microsoft Corp. Apple and Mac are trademarks of Apple Inc.